The new chicken house is coming along very nicely. Just in time! The first batch of chickens and the adult Ridley Bronze turkeys (from up-island) are arriving this weekend (more poults from a farm on Saltspring will get here at the end of May). Note the re-purposed closet doors! As we continue to tear apart the house during the renovation, we’re finding all kinds of ways to reuse the bits and pieces. I guess I should also explain that this little shelter was originally used to house the pot-bellied pig we took in a number of years ago. When Mikey succumbed to pneumonia one winter, the goats took over the shelter. A couple of years after that, we moved the goats to a new, bigger shelter up the hill and installed our first weaner pig, Francis Bacon. When Francis became sausages and chops, the structure was just crying out for new purpose in life. 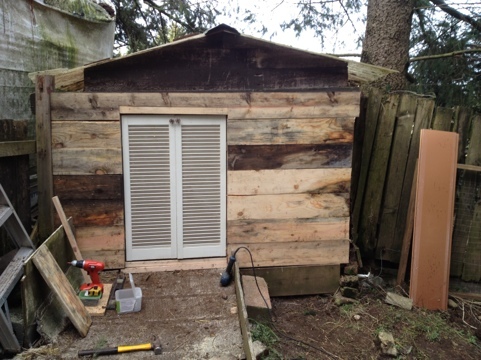 Voila – another incarnation as Chicken House No. 1. This entry was posted in Blog, Chickens, Uncategorized and tagged chickens, farm, Poultry. Bookmark the permalink.